There hasn’t been much Mini Veg going on here on Mini Piccolini lately, because there hasn’t been much proper meal planning and cooking going on at our place lately. Family dinners have fallen by the wayside. Little A usually naps right before lunchtime and has more of a snack when he wakes, my husband has been doing most of the cooking for Alec’s dinners. And for us adults, Takeout Tuesday often seems to appear already on Monday and is often repeated again before the weekend. My mother-in-law has been dropping off a lot of dinners for us. I get so lazy about cooking when I’m pregnant and usually mostly feel like having sandwiches if given a choice. When things get like that, it’s time to lean on old fall-back favorites, like this super quick and easy pasta lunch. Eat it hot or cold. Cook pasta (shells, orrechietti, penne, fusilli – whichever you prefer) in plenty of very salty water until al dente. Make sure you don’t overcook! 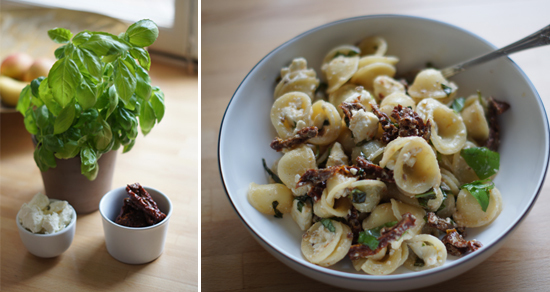 While pasta is cooking, chop up basil and sun-dried tomatoes. Crumble feta cheese. Add a good swig of olive oil and some freshly ground black pepper and mix it all up. Drain pasta and mix together with other ingredients. Done! For more family-friendly vegetarian meal ideas, click here. hey Mina! how are you? Such a great site – what gorgeous lunches! I keep seeing all these amazing kids bento box lunches and I am so in awe of all the moms who have to get those lunches together every day. We are SO lucky. Alec is served two proper snacks (fruit in the morning and yogurt, muesli, fruit, sandwiches etc in the afternoon) as well as a hot cooked lunch every single day. A few times per term they go on outings and we send along a packed lunch and I am always at such a loss… So lucky lucky us!